Posted on June 25, 2016 by Lena K.
Since I more or less dropped almost all shows that I had planned on watching—or started watching—this season (feel free to openly judge me for that), I had high hopes for the upcoming summer season, and I’m actually pretty sure this one won’t disappoint. So disregarding the fact that we will also do our seasonal “First Impressions” post once the new season has started, this one will cover the yuri-ish shows that we might want to get hyped about, even before getting a first taste of the shows listed. I’ll only name full yuri shows or those that might have some yuri content involved, and for those, I will add a category called “Potential Yuri”, which I will then grade as either High, Medium, or Yuri Goggles Material. Please note that this will only cover my personal expectations, so it might as well turn out very differently once the season has finally started. Plot: The main character, Suzukaze Aoba, graduates from high school and joins a game company. The person who made the game that Aoba loved as a grade-schooler just happens to be Aoba’s senior at the company. The story follows girls who work and aspire at the Eaglejump company. Potential Yuri: Medium – Knowing the Manga this one is based on, we might get some Yuri-ish scenes at least. Plot: Uranohoshi Girls’ High School, a private school in the seaside neighborhood of Uchiura at Numazu city, Shizuoka prefecture. A small high school in a corner of Suruga Bay, it is home to nine teens, led by second-year student Chika Takami, driven by one seriously big dream: To become the next generation of bright, sparkling “school idols”! Potential Yuri: Yuri Goggles/Medium – Just like the previous seasons, this one might come with a lot of possible shipping material. Plot: Hikari Kohinata is a cheerful 15-year-old girl who lives near the ocean and she spends much of her time diving as a result. On her first day of high school, she meets a teacher who also likes scuba diving. There’s also a 16-year-old classmate, Futaba, who gets dragged along in Hikari’s maelstrom as soon as they meet at school. Most of the manga so far details the relationship between the two girls, which quickly seems to move into romantic two girl friendship-territory. Title: Fate/kaleid liner Prisma☆Illya 3rei!! Plot: Fourth season of the Fate/kaleid liner Prisma☆Illya series. Potential Yuri: Medium/High – Knowing the previous seasons, this one as well might strike with some yuri kisses and other yuri-ish scenes. Plot: Sisters Yui and Rena live a peaceful life in the kingdom of Enastoria, but they become involved in a vortex of destiny when a giant robot attacks Enastoria. Potential Yuri: Yuri Goggles Needed/Medium – The description makes it sound a little like Kannazuki no Miko, doesn’t it? Well, even though it surely won’t have that much yuri, I think we can still get our hopes up for quite a bit of subtext, at the very least. Plot: Urara, Hanabi, and Inaho are three girls who aim to become nationally-renowned characters by creating animation of themselves! They chose the magical girl theme to catch the attention of everyone from children to adults! Can they safely become popular characters in a one-cours magical girl anime? Potential Yuri:Title: Yuri Goggles Needed – It’s a Magical Girl Anime, of course there will be some subtext. Plot: With just five students (none in the same grade ), the four girls of the tiny Asahioka Branch School still enjoy watching cherry blossoms, playing in rivers, digging potatoes, and building igloos together. The pace is very slow, yet enjoyable and heartwarming. This entry was posted in Anime, Let's Talk About, Yuri Anime and tagged Amanchu!, Fate/kaleid liner Prisma☆Illya, Love Live Sunshine, Naria Girls, New Game, Non Non Biyori, Regalia by Lena K.. Bookmark the permalink. Mahou Shoujo? Naria☆Girls is likely to be super terrible (since it’s going to be CG), but at least the tech behind it is interesting. I watched about 4 episodes of Haifuri, because I knew it would have some yuri and I also love Kancolle, so why not? Though, it was somehow a little boring…. Yeah I hear ya, I think for me I just couldn’t stop staring at their foreheads. They’re huuuge! I have the same problem with Flying Witch. I enjoyed the manga and am 5 episodes in to the anime, but I seem to have zero momentum for it. It’s just not keeping my attention. I’ve very high expectation on regalia either. cause their already set up many couples. Honestly, I’m a kind of disappointed because all the titles promise a lot of…subtext :(…I think only Amanchu seems like a good potential yuri but i prefer not to have great expectations…anyway, all these series present a good design and plot, so I will watch them and enjoy them!. New Game hype. Love the manga. What you watch and/or play is up to you. I picked up all these shows as well. A first impression post will definitely follow. 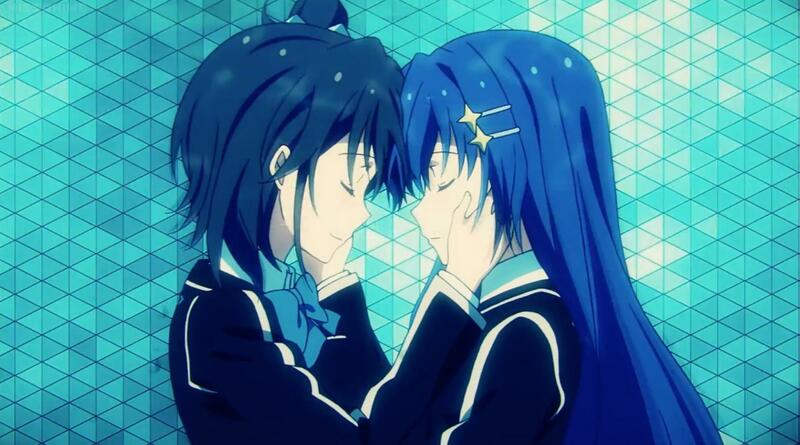 “Ange Vierge” might also have some possible yuri in it. There’s no dudes in it and it has some small subtext at least, but we’ll see.